This week saw worldwide centennial observances to mark the 100th year of the sinking of the RMS Titanic on April 14, 1912. This event, perhaps the “Queen Mother” of all disasters in our collective memory, continues to hold our fascination and interest after a century. Of course, blockbuster movies help to keep that interest alive, even when told Hollywood-style (i.e., with great artistic license). We all know the rest of the story: in a matter of a few days, the ship that “not even God could sink,” hit an iceberg and, within three hours, sank over two miles to the bottom of the North Atlantic. Over 1500 passengers died because of the pride of man evidenced by a lack of preparation. 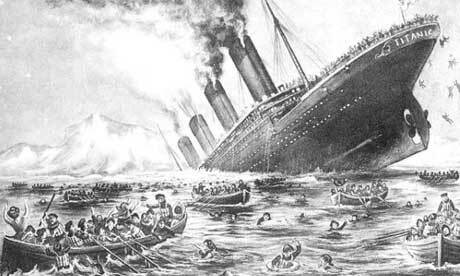 Sometimes I can’t help feeling that our world, especially Western culture, has many parallels with the Titanic. We have sailed in opulence while so much of the world is locked in steerage below. We have placed so much confidence in our own adequacy, our props, our wealth, our armaments, our accomplishments, that we neglect to notice that we are very small, very vulnerable, and very dependent indeed. One of the most chilling scenes in “Titanic” is when we see a shot of the ship from a great distance, firing emergency flares, almost unnoticeable in the vast expanse of ocean. It puts the ship into a starkly realistic perspective. I think we could stand to roll back for a “long shot” of where we are on the cruise of Planet Earth. We who have teethed on “have it your way” can prolong our illusion of invincibility as long as conditions will support it. Take away those barriers to disaster and we, too, could find ourselves in a similarly deadly and dependent place. Truth be known…in many ways, we are already there. Permit me a little fantasy: Let’s say the Titanic had had no lifeboats on board. And let’s say a rescue vessel was nearby and pulled up alongside our endangered ship, offering rescue. Let’s also imagine this Samaritan vessel is a rusty, oily tub with lots of fishy smells and residue—at any rate a far cry below what we experienced and felt entitled to in Titanic’s first class. Should we shop for a different lifeboat? Should we venture on a hope that there’s someone else out there with accommodations more to our liking? Great post – I know I am going to enjoy following your writing. I aways enjoyed your perspective on things. Glad you decided to create yet another blog.